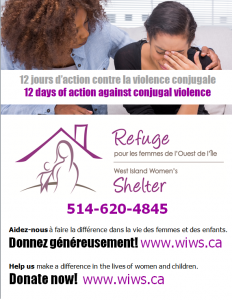 This is the last day of the 12 days of action against violence towards women, December 6th marks the sad anniversary of the killing of the Polytechnique Montreal. We remember the women who lost their lives that day, because they were women and because they wanted to study in a male-dominated field. We remember the women who lost their lives every day since. Geneviève Bergeron, Hélène Colgan, Nathalie Croteau, Barbara Daigneault, Anne-Marie Edward, Maud Haviernick, Barbara Klucznik-Widajewicz, Maryse Laganière, Maryse Leclair, Anne-Marie Lemay, Sonia Pelletier, Michèle Richard, Annie St-Arneault, Annie Turcotte visit site.